Burnett's works are one of the classical texts of homeopathy which are, and will always remain, a source of authentic homeopathic literature. The reason for bringing out this volume was to make all these works available on one platform for the readers. This makes the work more affordable and approachable. The pains taking task of compilation was done by the Late Dr H L Chitkara who did the research of all of the facts and data available before starting this work. It is his untiring efforts which have brought out this marvellous book. 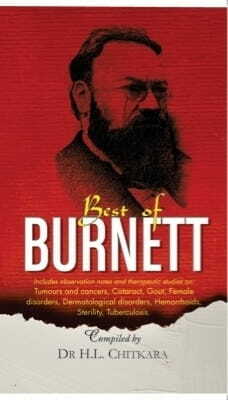 The short write up on the factual details of Dr Burnett`s life presented here is worth a read. The index and indices to sub-entries have been made after a much thorough processing to make this book user friendly. However, this book does not replace the individuals booklets if you require all of the information on one subject to be in one place rather than jumping around between the different sections of this book (therapeutics, materia medica etc).